Set a reminder to alert the manager before a booked holiday if it is still pending. 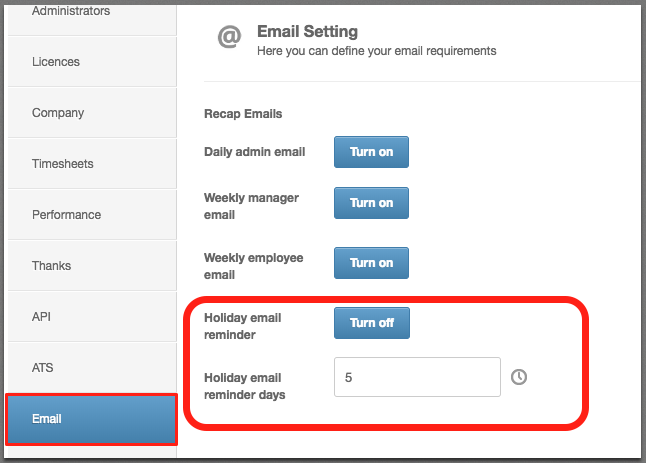 You can set up a holiday reminder email to send to the manager if they have not yet approved an employee's holiday. This email will trigger a chosen number of days before the day that the holiday is booked for, only if it has not yet been authorised. Once this has been turned on, you have the option to select the number of days before the booked holiday that the alert will be sent to the manager. For example: if this is set as '5' and the employee's holiday is booked for the 15th and is still set to pending - the manager will receive an email on the 10th to let them know this holiday needs authorising, and will receive another email every day up until the 15th, the day of the booked holiday.